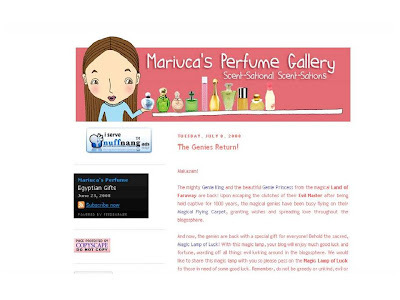 Mariuca's Perfume Gallery: MPG Gets a Makeover! YAY! I finally got around to changing Mariuca's Perfume Gallery's template! I'm such a procrastinator sometimes and though I've been meaning to change my template for the longest time and have been scouting around for a new look since a few months ago, it was only yesterday that I actually sat down and spent the whole day getting the new template up and running. Wow! So pretty!! I want a makeover too!! Yihaa!!!!! I am totally in love with everything her dearie especially the wallpaper.. like saying.. so in love with perfume!! I was glad I could help and at the same time improve my tweaking skill..hehehe.. now on the the next project.. Mariuca?? lolzz! Congrats dearie.. I'm sure you'll get lots of compliments on this one..and I'm sure you are now motivated to write here more no?? Oh I just woke up you know.. I slept at 10am I think and just woke up and now need to find something to eat.. I have to lepak at office today buat accounts lahh.. so catch you later!! GP! I sent you an email for the blogroll.. ok.. ke.. I think its overflowed coz you have one very long blog name in there.. it will follow the longest one.. but I put in a code in the html to shortened it.. does it look ok now to you? Pak cik kayo pak cik kayo ...heee (john chow lah) ...lovely design ...mantap!!! Oh I didn't get ur email LJ, it was somehow stuck in Spam! I think I'll leave it be for a while and might go back to my scroll bar for my Blogroll cause that one easier for me to handle. And can arrange alphabetically too, this one I had to do manually. But I dunno yet, you know la me, fickle he he! ok.. you decide and let me know.. eh if decide to do the blogroll as link list in your element let me know.. coz that one also i got a code to make it dropdown as well..heheheh...you know me.... all codes also i got...lolzz!!! ooohhh wowwww!! It's so sweeeet!! Just like you!! :D Love the hearts!! Who doesnt, right?? And LJ was right.. you're gonna get loads and loads of compliments on this one! :) Here's to a new look and lots of love going around!! Cheers!! I just love love love it! Its so very nice. Have a good weekend. Hope you're having an excellent weekend. the new wallpaper really sets it off..
great job ...you make a great team!!! p/s: i can load MPG faster than Mariuca. Like I mentioned before, I love this new look. I so much want to get rid of those dots in my blog. It's so not unique! One day I'll get there. Like you can count on LJ I feel I can count on you and LJ too (hehe) to help me out with those blog technical issues or any other issues really. Thanks for all the help I received from you since day one.Woofies. PS: I'm a top Mariucan here too, isn't this great?YAY! LJ, thanks so much dearie! I will keep the Blogroll this way for now yay! YAY, Jean is here! Thanks sweetie, I feel MPG loads faster too now and don worry, Mariuca will be getting a makeover as well he he! Back for a quick hello before hitting the beach early (10:30am!) in Bay Head, New Jersey...the John Cougar Mellencamp concert last night was great, but I don't think the girls will give me time to post about it before hustling me off to swim in the ocean. I have a tab menu above now too.. I just haven't added anything to it yet! LOL! Anyways, I've got a tag for you! Me just on my rounds now.. Happy Sunday sweetie!!.. hehe.. yelah.. sometimes me pun.. nak open comment box pun berjanggut lah sometimes! hehe.. I know.. i see your EC card..lolzz... and YES!!! number four there.. but no where in sight here at MPG lahh!! heheh.. I have my MUST bookmark... I click those daily first.. so won't forget for sure!! Okies, also want to ask u if I should add MPG to Blogsvertise? Of course.. though BV so banning me I think , you should add them to your listing.. go all out dearie!! Yelah GP! From that day email.. never wrote to me to update me pun.. they say wud re-evaluate my blog.. eh you think I should write them a nasty email?? After all they still owe me money you know.. and the post is still up! heheh.. Ok GP I'll try that.. me going out too.. to Iimmmigration at Damansara to renew my visa and another voiceover session at TTDI...yihaa!! OMG! You're renewing your passport as Damansara as well?? lol!! Wah!!! are we fated to meet?? lolz?? Me going to third floor but probably going after lunch coz they work faster after 2pm you know! OOhhh Shah Alam also got IMM eh.. did not know that..lolzz!! I always thought it was only at Damansara..lolzz!! Good template bu had trouble readin the pink against the white. Good to see experimentaton going on here! I was at IMM from 2.40pm to 4pm! Not too bad but room for improvement.. definitely! Men are always like that lah GP! To them all pics are ok.. Azwaj pun sama gak..lolzz.. eh you buat passport tu nak gi holiday eh??? Wow.. terrific service for you lah like that.. depa takut you throw tantrum kot...lolzz!!! Wah.. big vakasi in Oct?? Awesome.. jeles lahh!! He he he...nasib baik fast and efficient! So we had nachos at this Mexican cafe in Shah Alam while waiting for my passport. Not bad la Shah Alam lol! Of course, GP needs a magical vakasi soon, come to me vakasi!! hehe.. kedai makan mamak jer.. Maulana...you tau kat ner?? Oohh i love soto!! wah will try it next time though got to check with M if he knows where it though... azwaj is hopeless around this area :)...lolz! Muhibbah?! As in the restaurant that flattened M's car??? heheh... you like to eat there is there.. That restaurant is sama deret with M's office lahh!! and that is where I am right now...!! lolzz!! Oh yay, Boldie is FINALLY out, been waiting the whole day. DL! Boldie's out?? Yeay!! Can't wait to download when I go home.. aiyoo another cold trip on the bike tonight... tadi hujan kan?? I did not expect to be this long here so tak bawak sweater lahh!! Wah 75kbs.. wah very laju lah..!! Hi Marzie, hope you are better from your sinus. I wonder if it's the kitties' hair. There are so many templates out there,agreed, but I haven't found one that is not going to mess up all the rest( again all this HTML things). Mama added you in FB, she said she was Sushi's Mom,and that's true! She's waiting for you to add her too. Woofies. PS: How do you like nuffnang? Hola Marzie. It's Scent-Sationally Stunning my dear !! I like this new look.. Looks fresh and sassy..
ohhh yerr.. thanks for dropping comment.. Your blog is very much good. I am very much impressed by your blog content, i also come across number of sites for the perfumes for the cheap colognes and discount perfumes you can also check these are also very much useful for everyone. what a pretty template u have here. sweet! Hi Sushi! Thanks for ur concern he he, so many thing can trigger off my sinus attacks actually, including seafood and of coz dust. I am feeling great today, thanks! LOL, I love your comment Naz, esp the 3D bit he he! How abt my little perfume bottle? Cute or not? He he!! Marzie, the Ooh La La perfume at the bottom is definitely cute. GP!!! Oh I need to sooo biatch about Boldie...lolzz... what is wrong with everyone?? It's like a big grand gesture from K to sacrifice her happiness for B?? Come on!! Nothing went on between the two.. chances are N felt more pity then love for the the girl...Apa yg Donna sibuk sgt tu.. on the wedding day lagi!! Crazy woman!! Please everyone stop analysing N's feeling already.. sat ni from nothing there.. jadi something... aiyah!!! GP! Already dropped my card just now.. but now want to drop comment with my name...lolzzz! GP! Am dropping my LLP New EC..hehe.. I so love Sushi's EC here.. he is so handsome.. dun you think..like a little policeman!! so adorable lahh!! Ha ha ha you are right LJ! Sushi does look like a lil' cop so cute meow!! He he he!! Boldie boldie, left me dumbfounded la! And don't forget abt the PI, what's his name, forgot oredi. Dah la tak cute. I C U 2 at mypoochlife! Did you set up this way? Or is it just a coincidence? Really cool! I'm so glad I could afford this before MPG became way too expensive for my skinny piggy bank hehe. Now it's just out of my range, so I'm happy to be here today! That means MPG is rocking more than ever and that I need to work twice as much to be here again. Woofies. Just dropping by with Bay Head Blog. After all of the effort I've invested in SocialSpark, those idiots have decided to delete everyone's props and start over... I had 1,005! So my head is spinning...I think I may have to go to bed and pretend it was all a nightmare. GP! You dl Friday's ep already?? mon ep dah kluar ke?? The whole Logan family needs to be shot!!! lolzz!! Are you accepting ads on Mariuca? Whenever I run a search, on MPG shows up. Lil'cop hahaha, you and LJ are cute! Oh yay, glad to hear MPG worked her magic on ur blog, and of course Mariuca is accepting advertisers! 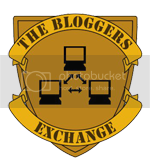 :) You can click on MPG's avatar, and you will see Mariuca there as well, under other blogs by this author. Can't wait to have ur cute avatar at Mariuca too Sushi! GP!! now you understand right.. OMG!! I really can't wait for the next episode.. eh you dl already?? dah ada tau!! Lil Cop Sushi..you're so cute lahh!!! hahaha.. OMG Eric is right!! lolzz!!! and yes cute lah sushi!! so adorable...sayang tak boleh pegang kan?? I like the yawning one..lolzz! such a cutie pie lah he!! GP,Lil'Cop is here again:) I browsed for your blog in EC as Wishing on a falling Star and it showed up, but if I type Mariuca only MPG shows up. I'm glad I found both now and my next purchase(I'm nearly able to afford it:) will be Mariuca. Thanks for sending me your add I'll make the magnet start its trip to Malaysia! Hi Marzie, I really like it when I'm extra-fluffy, how are the kitties doing? How do they cope with Malaysia weather with all that fluff? Yeeha! Chicago magnet on the way, can't wait to see what Sushi picked out for GP, love ya! Yipee Marzie, just bought ad at Mariuca's! I'll be peering out there soon, yay! I'm also thanking you for advertising at My Pooch Life, both of your EC cards always look great on my sidebar! Woofies. Oh thanks dear LJ! Marzie, LJ said to me: You're so cute lahh ! I've seen this work so many times, is that Malaysian and what does it mean? I like it! You say something and you say LA, cute! hehe. Sushi mmg fluffy....and darn cute!!! Have you seen his latest video? ?